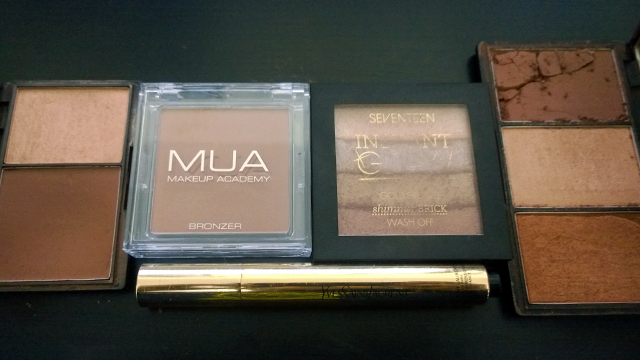 I use a combination of products to contour. I try to keep it subtle because full-on contouring for an average person in the daytime can look too “done” or over the top. I’ll turn it up a notch if I’m going out at night. Let’s face it, I’m not going to get snapped by the paparazzi and put on the front of a magazine am I? use the dark shade in the Sleek kit to contour the shadows in the classic “3” shape- sides of forehead, hollows of cheeks, sides of chin plus the sides of nose. I use the light shimmery shade on the top edge of my cheek bones and sometimes sweep this up to my temples. I also use it in the middle of my forehead (risky I know!). I find I need a little something more with this kit so I add blusher to the apples of my cheeks and blend out. I either blend as I go along which is ideal, or blend it all afterwards. With this all-in-one palette there’s no need for anything else. The dark and light shades are the same as in the Sleek Contouring Kit in Medium so I use them in the same way as in the contouring kit. I then apply the bronzer to the apples of my cheeks and blend out. The MUA bronzer is not as dark as the dark colour on the Sleek palettes so I use this when I don’t have a tan or when I want more subtle colour. I use it for the shadows in my contour routine. I then use the three bronze colours in the Seventeen shimmer brick on my cheeks and the lightest colour to highlight the cheekbones. This is my favourite combination. If I want a more dramatic shadow I use the dark colour in the Sleek Contouring Kit in Medium with the bronze colours in the Seventeen shimmer brick on my cheeks and the lightest colour from the shimmer brick to highlight the cheekbones. For all of the options, sometimes I use Touche Éclat on bridge of my nose, under my eyes, under the brows, on the cupid’s bow and in that crease above the chin but below the lip. What is that called by the way? Hi the touche éclat thing is called highlighting 🙂 Great post I use the sleek face form kit too, its so handy and saves having loads in your makeup bag.